Hours spent quilting lining so far: approximately 6. Pieces finished: 5 of 12. Guess my piece/hour estimate was a bit off… spent last night and part of tonight on the middle back pieces, which had a bit more surface area and therefore took longer. I also took a little bit of a break to work on my swimsuit–got the new one from North Shore Swimwear last weekend, and discovered that it didn’t have pads in the cups. Which, for me, is a must-have. So I took the pads from my old tankini from there and sewed them into the new one. Had to do it all by hand and very carefully, because it snagged on the outer fabric quite frequently, but it’s laying much better now. Will be taking a bit of a break from the quilting this weekend– another crafty day with N, and just to shake it up a bit, I’m going to take scrapbook stuff. I might not actually finish any layouts, since I tend to like to do my journaling on the computer (my handwriting tends towards the illegible, especially when I’m in a rush) and I’m way behind on those. So it might just all be assembly prep, but we’ll see how it goes. Hours spent sewing tonight: a little over 2. Pieces of lining quilted: depends on how you look at it. 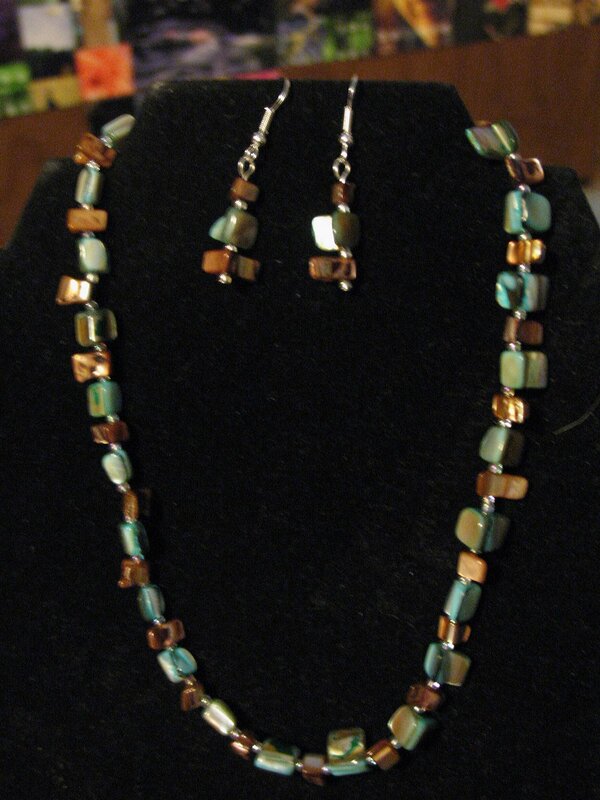 One pattern piece, both halves. So the front lining piece is ready to go… now I just need the back/side back/2 piece sleeves. So that should be what, 8 more hours? I haven’t had a lot of time for sewing this week–though I haven’t had a lot of teaching in the evenings, since things won’t really pick up there until the school year really gets started, I have been out quite a bit this week, between helping a good friend move and various social things that have come up. It’s likely I’ll be doing some sewing for said good friend’s new apartment– she’s got a futon that’s actually using the mattress from my old futon-that-I-used-as-a-bed, and the mattress got kind of dingy while storing it in her basement, so I’ll probably be making a slipcover for it at some point, once she gets all the moving-in stuff sorted out and gets some money for sheets to make a slipcover from. Editing photos from the road trip. Nothing too serious, just generally touching up the odd purplish tint that photos taken on manual settings on my digital camera seem to end up with, or a little cropping here and there. I’ve done several photos already, of course, but this is the first time I’ve sat down and systematically gone through them to make sure I’ve done all the edits I want to do. Also uploading them to Snapfish as I go in preparation for getting prints (will also make it more convenient for Julie to order her prints.) So far, gotten through 4 days of the 14 this way, though it’s technically 13 because I didn’t take any pictures the day we came home. A little bit of computerized journaling for scrapbooks. Still hoping I can get through enough of that to sit down and do a scrapbook binge sometime next month, though I might want to get some done sooner– I’ve got tentative and as-of-yet dateless plans to get together with two different friends for crafting, and scrapbooking would likely be on the menu. So journaling must get done. The big thing this week: working on my peacoat. Name, of course, comes from that old TV show of the same name, since I always liked Felicity’s black peacoat that she always wore. It’s still in the absolute beginning stages, since I had to completely resize the pattern before even starting. 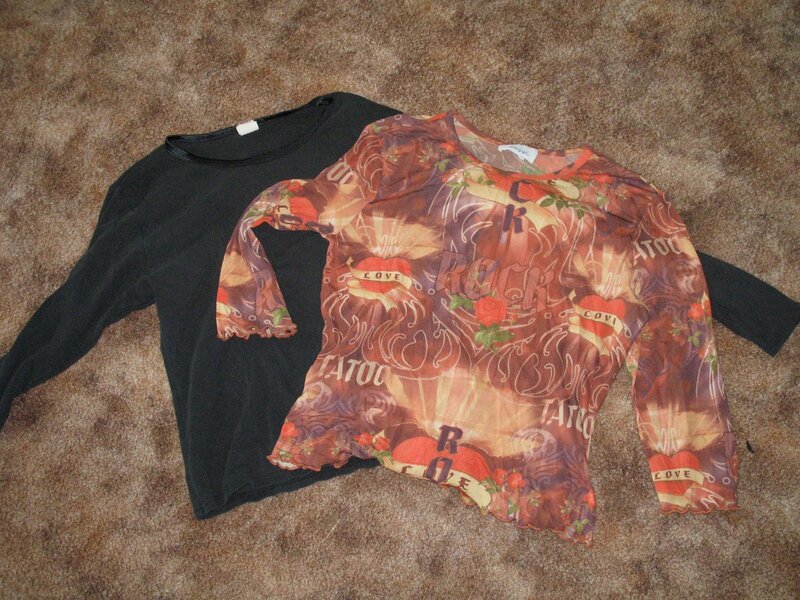 When I went, they only had two size ranges in the pattern–one below and one above the size range I actually wear. I figured it would be easier to downsize the 18-22 than upsize the 6-10, so I spent about 3 or 4 hours this week doing that, with the help of some instructions from Sew Stylish magazine. Over the last 2 or 3 days, I’ve also managed to get the lining cut out. No outer shell yet– I should have taken it down two sizes, technically, but I only took it down one to allow both for fitting over bulkier winter clothes and any mistakes I might have made on the resizing. I’m making a fully quilted lining with two layers of the thin-but-warm quilt batting that my mom favors, and since this is the bulky part of the jacket, figured I’ll get that basted together first, try it on over a sweater to check the fit, make any necessary adjustments, really sew that together, and then construct the outer shell of the jacket with whatever adjustments I needed to make. (The other factor is, I think it’ll be a lot easier/less expensive for me to get more of the batting and lining fabric if I really mess up than it will be for me to get any more of that embroidered suedecloth, so I’m not cutting into that until I absolutely have to!) I’ll also have to remember to get to Joann’s this weekend, since one of the Labor Day sale specials is buttons, and I haven’t gotten any for this coat yet. I really hope this works–given that it’s fully lined, a Vogue pattern, and that I’m complicating things and adding a lot of time to it because of the quilted lining, this could easily rank in my top 5 most complicated projects I’ve ever sewn. I haven’t started the quilting yet–maybe tomorrow, but I told B that if she needs help with her apartment after she gets back from tomorrow’s IKEA run I could do that tomorrow afternoon/evening, so I’ll have to wait and see if she takes me up on that or not. A little wrinkled since I wore it before taking the picture, but you get the idea. Simple yoked drawstring skirt from Simplicity 7229, which has become one of my standard patterns because they’re soooo comfy and due to the drawstring, the capris always fit me. I have a black linen skirt from the same pattern, which I’m going to leave as is, because the plain one is more forgiving of the mid-calf length than this embroidered one was. I do have to say the length works much better now for this particular skirt. So instead, I shortened a skirt tonight. No pics yet, since I still need to iron the new hem flat and I’m too lazy to do it now. (Plus I forgot to take a before pic on my digi. It’s one I made years ago, so I know I have a print somewhere.) Chopped off about 10 inches to take it from awkward mid-calf frumpy to just below the knee. I put it on, and all I could think of was this The W’s song, “Flower Tattoo”. So thus the name. Anyway, here we go…. Started out with this– a thrifted mesh print shirt that I loved but was shorter than I was comfortable with, and a black knit shirt that had a hole in the back. 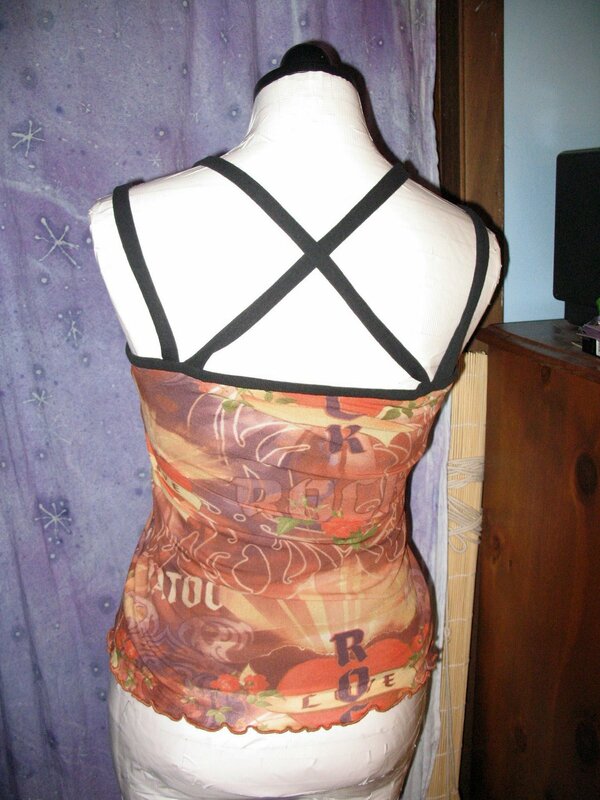 The crossed straps were a flash of inspiration– didn’t want to do quite my usual tank top, but I need to be able to wear a bra with it and didn’t have time to rig anything up for a halter. Finally, confession time: I bought a swimsuit. A several months’ search of not being able to find fabric I liked (including on the internet), a general lack of good luck with sewing knits (though, go figure, I did discover on this shirt that using the walking foot does wonders for avoiding puckering! 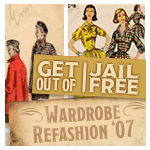 ), and being tired of having ill-fitting swimsuits left me kind of fed up. So I ordered one from the same place that I got the last one that I really liked from, North Shore Swimwear. Got the Claire top with the #23 bottom, since poking around stores gave me nothing with boy shorts and that’s basically the only style I can walk around half-naked in and be vaguely comfortable with the amount of coverage. No pics left, because it’s in progress and I’m too lazy to find my camera for the before pic right now. But I’m remodeling two shirts into a tank so I can wear it this weekend for Purple Door. 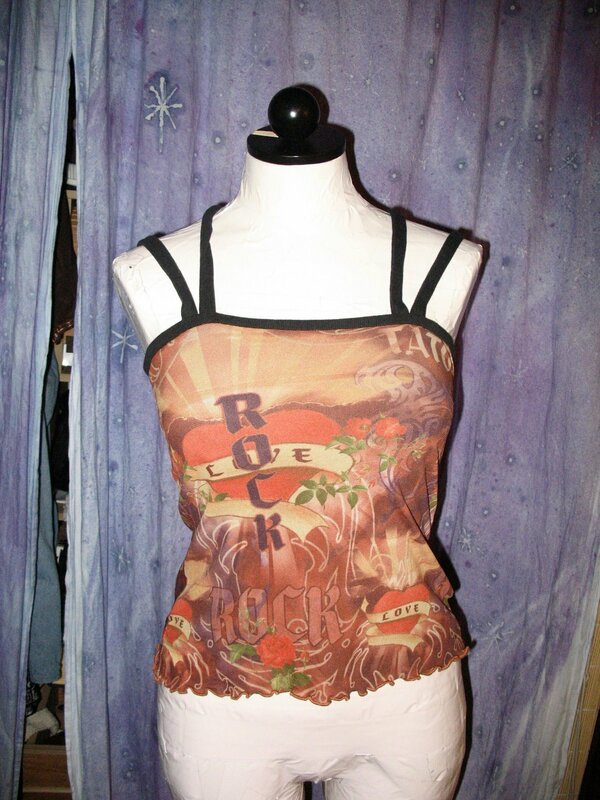 So far, it looks like a tube top. I had a band sewn around the top, but I had to take it off because my attempt to make it a little snug so it wouldn’t gap worked a bit too well. That, and I need to angle it a bit so the back’s a little lower and such. So tomorrow, I must finish it. I was actually pleasantly surprised to finish this one tonight– it felt like it didn’t take very long at all. It would have been a lot faster though, if I hadn’t spent a couple hours on Saturday quilting the fabric. I like the way the quilting turned out, though, it added some sturdiness to the bag that wouldn’t have been there otherwise, and it was good practice for my upcoming coat lining. I’m not sure I’d use this pattern again– the directions were kind of confusing, but I think that’s largely in part to my changing the dimensions, especially for the interior pockets. 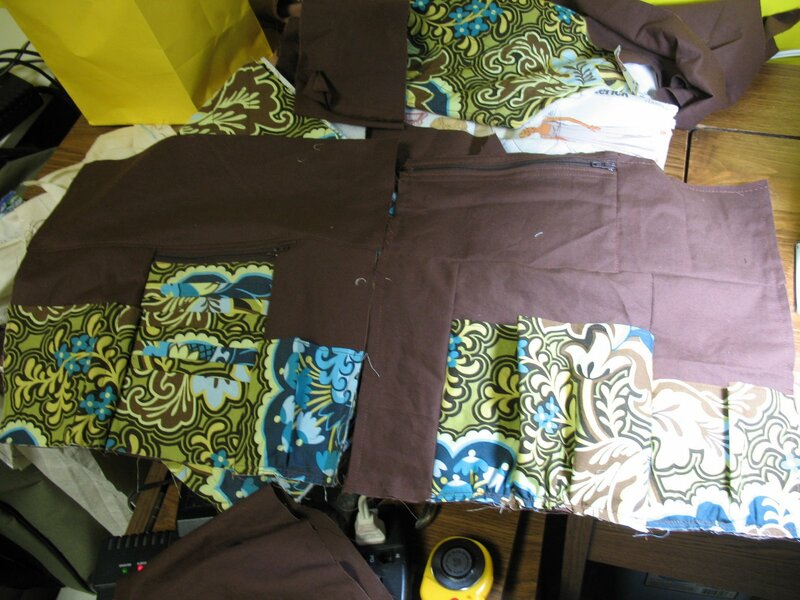 And I didn’t actually use the pattern– I just measured the rectangles and cut them out with the rotary cutter. So it might have been a lot easier to match things up if, you know, I had actually followed the directions. Haha. Hopefully this bag will work out– since it’s got pockets for my change/bills (zippered) and credit cards, in theory I should be able to ditch my bulky wallet. (The change pocket never stays zippered on it anyway.) It also has pockets for my evil cell phone, daytimer, sunglasses case, pens, etc. (and due to my alterations, it’s big enough for whatever book I feel like hauling around at the moment). As for closure, I have two buttons near the bottom, and loops on the bottom of the flap. The pattern called for a magnetic clasp, but I haven’t had very good luck with those in use. As for last year’s fall/winter purse, I have plans for it. Mwahaha. On a more serious note, I might be doing some alterations. On a formal dress. One of my good friends is a bridesmaid in another of her friend’s weddings next weekend, and I guess she lost some weight or something because the dress is too big at the top (a problem since it’s strapless.) She told me she’s been calling all sorts of alteration places, but no one can do it in a week. So she had two more places to try, but if she can’t get anyone to take care of it, she’s going to bring it by tomorrow to see what I can do with it. I have to admit, I’m a bit nervous about it. While I’ve done all sorts of refashioning for myself, I’ve done very, very little in the way of clothes for other people (the Ren Faire costume I made last year was pretty much it, actually). And since it’s a bridesmaid dress, I wouldn’t want to horribly screw up and make it look different from everyone else’s dress! This was tonight’s work, finishing piecing together the lining. The directions for the bag, which I probably should have read a little more closely before jumping in, involved sewing together backings for the pockets and that would piece together the lining, but I didn’t realize that until I actually started sewing the pieces together. This process was made far more complicated by my making it larger and deciding to change what pockets would actually be used. So besides the two segments that had gotten finished over the weekend (to the right on both pieces), it took me another two hours tonight to get lining pieces that were the right size. (Partially because I decided to give up reading the directions and winging it– I was so far off of them that they were more confusing than helpful anyway.) I did manage to put in zippered segments for both my bills and a change purse, though the change pocket took me a couple tries to get it pointing in the right direction. I also managed to get the lining pieces sewn together (minus one seam of the bottom, which I’ll sew once it’s in the actual bag), and basted together the outer and lining sections for the flap. The Gothic Rose bag, con’t. Name comes from the fabric this time. Had a great time with N this weekend– sewed until about midnight this morning, while munching on homemade chocolate chip cookies and watching Disney movies. The bag isn’t done, but I did manage to get all the outer pieces quilted, as well as make some good progress on the pockets. The pattern I’m using has the inner pockets sort of pieced together like a jigsaw puzzle, and since I’d decided both to make it bigger and leave some of the designated pockets off, I need to figure out how I’m actually going to do it, and my brain is just not up to it now. But it’s a good start. 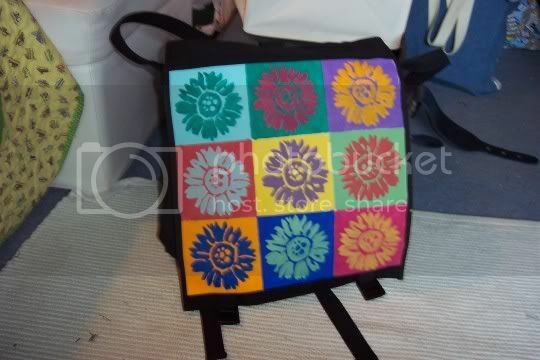 I started cutting out a new bag last night, to replace this one from last fall. After all that trouble I had sewing it together, by the time spring came around (which meant switching to this more brightly colored one) the stitching was beginning to come apart in several places. Probably due to my trying to carry things too bulky for it, like my daytimer (and, well, a book for reading.) 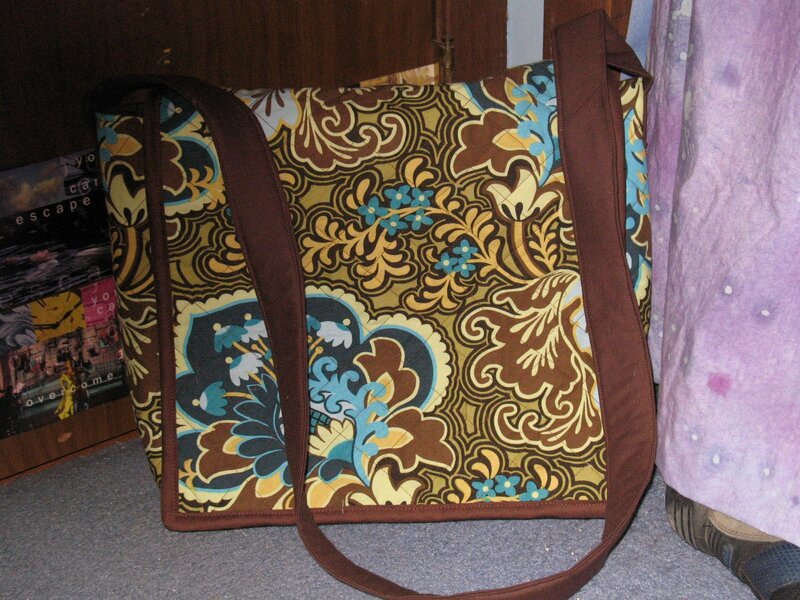 I still love the fabric though, so my plans for the old bag are to recycle it into a much-needed checkbook cover. Anyway, I’d found this really gorgeous Amy Butler fabric when I was out shopping with my mom the other day, so I caved and bought it. 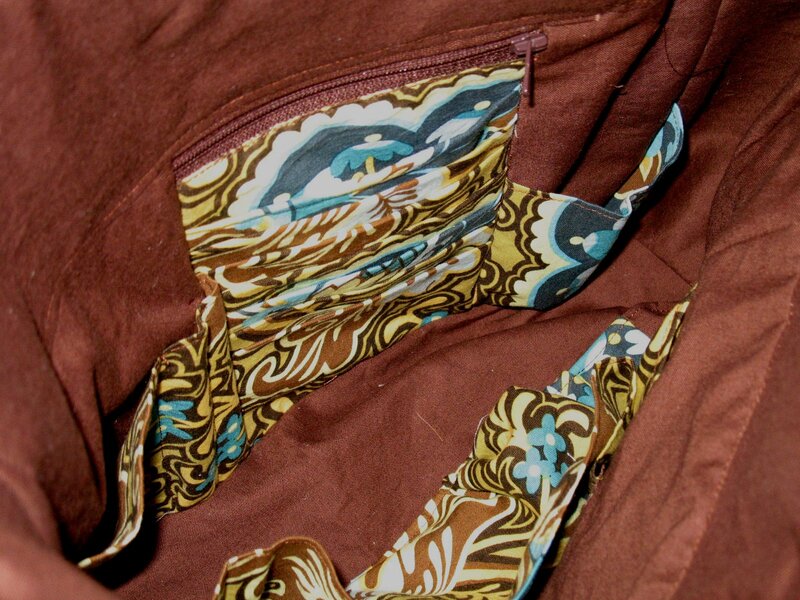 I’m adapting one of Mom’s bag patterns too (since she has a billion)– if it works, should eliminate the need for my bulky wallet (since much of that stuff is in the liner) and still leave me room to carry a book. I got the exterior cut out last night, but since I got a late start, ran out of steam and so I need to finish cutting that out this morning so I can haul it all down to N’s house for our crafty day! I’m also having a little archiving debate. Before I started this blog, I had gotten into the habit of doing one offline, so to speak– basically just a Word doc in which I did the same kind of rambling about ideas and progress that I do here. Since I started doing that back in early 2003, you can imagine that it’s a rather huge doc! And also hard to find things in. So I’m strongly considering backlogging them on here, since having all that sort of thing in one place is one of my few things I anally want to be organized about, and so I can use the tags. It would be time consuming, especially if I do link in the pictures of the past projects I took, but mostly copy-paste so probably less time-consuming than skimming through the whole file to find things in the long rum. Must consider this.